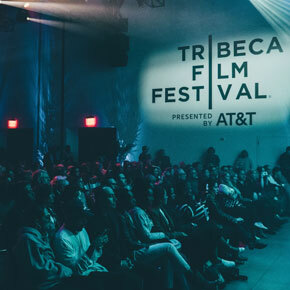 It’s almost time for Tribeca Film Festival 2019! Be sure to subscribe to the Podcast feed for our “Live from the ‘Festival” podcasts from New York. 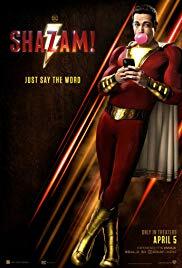 Can DC return return the fun to the Superhero genre with ‘Shazam’? 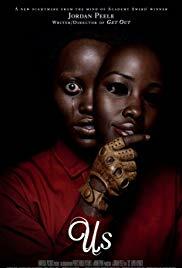 And does director Jordan Peele once again deliver the goods with ‘Us’, his spiritual successor to the highly acclaimmed ‘Get Out’? With the Academy Awards looming next week, it’s time for us to do our annual discussion of our favorite movies of 2018. Join us for a chat of and run down of our top 3 films and then a lively discussion about what’s happening with the Oscars. There were so many good films released in 2018, that to whittle them down to just ten seemed a betrayal. Isn’t the point of these lists to bring your personal recognition to the best, the most adventurous, the most humane, the most risk-taking of films. So spread the wealth, I say. Recognize more. I have my top 15 films, and then a list of ten more to round off the top 25. And I even cheated with placing more than one film in a ranking occasionally. Whatever it takes to shine a light on the better films. Also as in past years, the films on my list are those that changed something within my emotional circuitry. 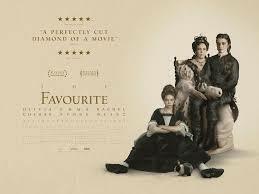 Filmmaker Yorgos Lanthimos throws battery acid at the British period piece genre. He gleefully incorporates anachronistic costumes and music, and invents plot where there are historical gaps ,to create something deliciously nasty; I watched most of the film agape. The script, by Deborah Davis and Tony McNamara lets each of the three female leads be conflicted and scheming, wary and hilarious, and altogether human. One woman has usurped the powers from the frail Queen Anne, and another is, at any cost, on her way up literally from the mud into the queen’s chambers. One measure of a better film is this: you come out after watching it and immediately wonder why no one thought to tell this story before. A QUIET PLACE has the simplest of premises: a family trying to survive in a future world ruled by aliens that hunt by sound. As far as visceral thrills go, no film this year did better. 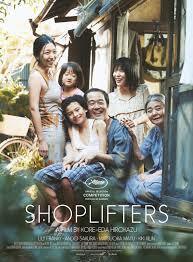 Ah, is there a more humanist filmmaker working today than Hirokazu Kore-eda. For more than a decade he has made films that refuse to make easy villains of any of his characters. He takes a story from the Japanese headlines, and compassionately examines how that might have come to be. Like Koe-eda criminally underappreciated LIKE FATHER LIKE SON, this film too asks the viewer to reconsider our definition of ‘family’. The film is also a grand showcase for its actors, including his long collaborator Kirin Kiki (who passed away soon after the release of the film) and the unimprovable Sakura Ando, who tackles what might be the most subtly complex role of any in cinema this year. 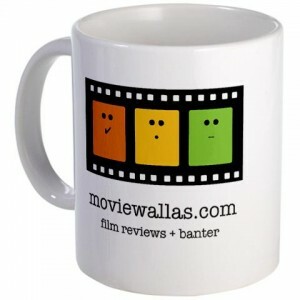 I have learned over the years that the single greatest deterrent to the enjoyment of a film is high expectations. 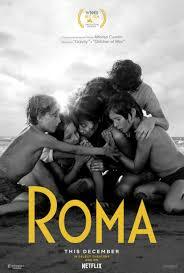 By the time I saw ROMA it had already been hailed as the best this and best that. And yet, from the opening credits appearing over floor tiles splashing with foamy water, to the quiet end, I was displaced. Displaced from my cinema seat to another time and place, at once silvery and unreal in glorious black-and-white photography and as invasively authentic as turning the pages of someone’s brittle, tissue spliced photo album. 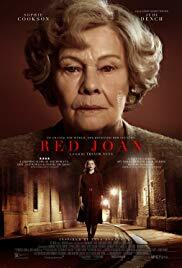 Perhaps my reaction to the film owes much to the fact that I too grew up in the early seventies in a busy city, and under the full influence of many a domestic help. This film will hold up well to posterity. Most days in 2018 felt like the world was in a race to greater isolationism. And the one thing that we could use more than anything else was objective unconditional empathy. I was most grateful this year then for the triptych of films that were all about individuals on the fringes of society that we would rather not consider. Or at least those we would prefer to actively ignore. All three films, excellent pieces of cinema each, are empathy generators asking us to re-examine our outsiders, by any definition, be it economics, mental health, or geography. 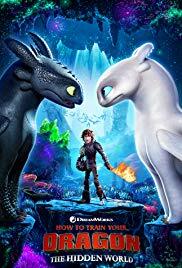 A man in his late twenties hesitates to introduce his affluent girlfriend to his rough-hewn family, only to have his parents sheepishly announce that they are expecting a child. Another film would have taken this clever premise and made a soap opera out of it. But BADHAAI HO has no interest in tired plot gymnastics, or feckless humor. It takes its central conceit – the imminent arrival of a child to a couple of a certain age and authentically watches it’s impact on every member of the family and surrounding neighbors. And uses this to craft some of the wittiest writing this side of the Atlantic. What can I saw, I laughed and I cried. How often can you say that. This is a heist film, but to call it so is severely reductive. 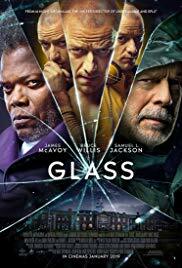 Director Steve McQueen takes this genre and uses it to construct a dense labyrinth of characters set around contemporary Chicago to create something Shakespearean: layered, marked by shifting loyalties, and bracingly tragic. 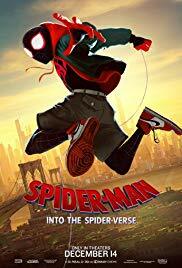 Make no mistake, it takes no small measure of brilliance to create what looks like a gangster theft film, which is also a deeply, consistently satisfying entertainer, while deftly commenting on the state of race, class and political rot in contemporary urban America. 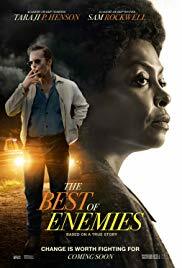 The film starts with a con job gone spectacularly wrong, killing all involved, and proceeds with the mafia leaning of the widows of the dead men to recover the spoils; the women band together to pull off a final heist. 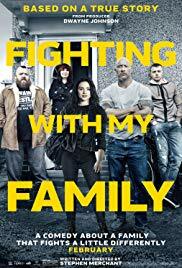 With this pedigree and this cast, this film should have been a flat out hit. That it isn’t is both a mystery and a tragedy. There is more gonzo creativity in this film than any other ten films released this year. 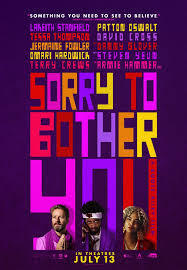 Writer-director Boots Riley has so much contempt for the state of race relations in contemporary America, and so much righteous anger that he can barely contain in within each frame of his film. So he throws everything he has onto each scene. Some of it sticks, some of it doesn’t, but it is nothing less than giddying to see pure ideas thrown at the viewer at such rapid-fire pace. 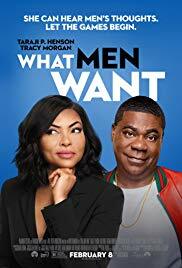 It is futile to try and explain the plot, except for the basic set-up: an out of work African American man who gets employed at a call center, quickly learns that he can be highly ascendant in this career by taking on a Caucasian voice. And then things go to poop, as they say. 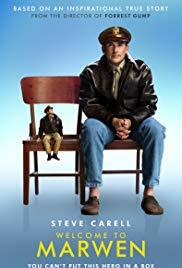 Gleefully surreal, nakedly bruising in its strife for social justice, and unbound by limits of reason or logic, the film takes off into a cloud of absurdist genius. I do not usually gravitate toward Westerns. 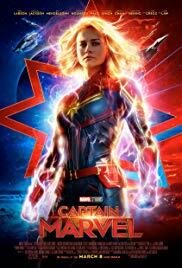 And yet here is another film that takes the outward shell of a genre and uses it to beautifully comment on human failings. 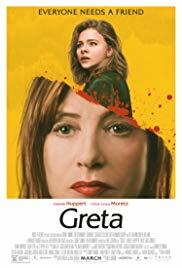 This English language film, directed by a French filmmaker, based on a novel by a Canadian, and starring American and British actors is something to be experienced: funny, unexpectedly insightful, and wistfully tragic. 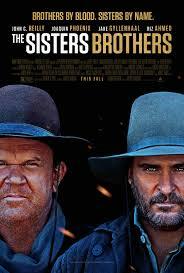 The film is like a hybrid of HIGH NOON and IN BRUGES. And how can you pass up the opportunity to see John C. Reilly, Joaquin Phoenix, Jake Gyllenhaal and Riz Ahmed in peak form. There is a scene late in the film where the eponymous brothers arrive in 1850s San Francisco that is wonderfully realized and a marvel of Production Design. 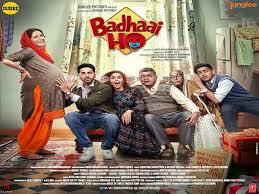 Best of all, there is a lot that remains to be unpeeled after having seen the film. 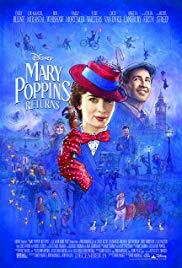 This film is many things, but what has endeared it to me is that from the first scene of a mother softly brushing her son to calm him down to the very last, it seeks understanding. In cinema’s pursuit of taking on the most challenging and taboo of topics, it has often ignored one staring in the face of so many: the post-natal challenges of motherhood. In our fear of anything short of the glorification of the state of motherhood, the unpleasantness of it, the physical and psychic stress of it goes unmentioned. TULLY handles with authentic agency. Watch out for Chilean filmmaker Sebastian Celio, who has had an untarnished streak to date. He is beloved by arthouse movie fans and his A FANTASTIC WOMAN nabbed the Best Foreign Film Oscar last year. 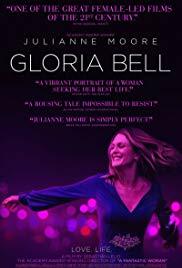 It won’t be long before he becomes a household name, perhaps no sooner than the release in 2019 of GLORIA BELL, the English language remake of his GLORIA. But look no further for evidence of the magic of his craft than the woefully underappreciated DISOBEDIENCE. A woman (Rachel Weisz) returns to her orthodox Jewish London community upon news of the death of her father, the rabbi. 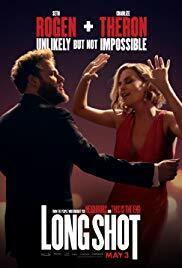 Her return triggers a disruption within the insular world, not the least because of her renewed friendship with the wife (Rachel McAdams) of the expected new rabbi. 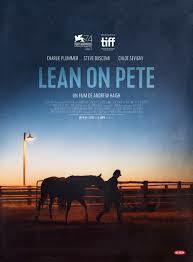 Smart, brave, questioning and ultimately empathetic the film ponders on the impact of warring with tradition. If films could create their own language. If the experience of the lesser other in society can be rendered on screen. If the social issues of fifty years ago remain woefully relevant even now. If the colors and visual composition in a movie can take your breath away. 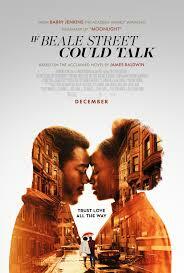 If a decades old James Baldwin work can breathe and be breathy on celluloid. If the ache, and the burning seething heat of new love can be conjured up. Then one gets a film so perfectly composed, acted and brought to its inevitably artful end. Then we would get IF BEALE STREET COULD TALK. 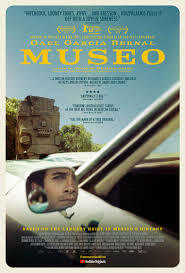 Two men from relatively affluent families, afflicted with the usual discontent of youth, pulled off the biggest heist of artwork from a museum in Mexican history. They also thought that they could sell the spoils of their theft relatively easily to make money, even after the media blitz that followed the robbery. Always ahead of the audience, this artful construction of the events, plays like a terrific thriller. 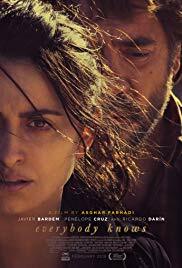 It also is Evidence H in the case for how criminally underappreciated Gael Garcia Bernal remains in cinema. Not too long ago a man working for the Norwegian police opened fire on the streets of Norway, and then took a ferry up to an island off the city and systematically hunted and shot down children who were camping there. To make a film about a hate act is a high challenge, because it can come off wrong twenty seven ways: being too preachy, or heavy handed, or sentimental, or glib. Paul Greengrass uses his mastery of craft to retell this story with objectivity. 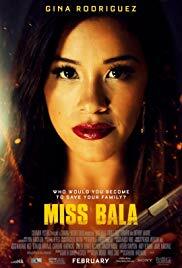 And while the first part of the film deals with the actual events leading up to those acts of domestic terrorism, the second half follows two individuals: the court-assigned lawyer to defend the shooter, and one of the teenagers who managed to survive the attack on the island and is under the pressure to speak at the shooter’s trial. 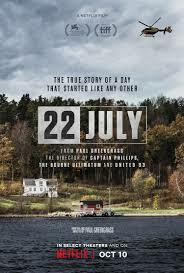 This is a sobering, bracing, and ultimately hopeful film that is asking each of us to contemplate global terrorism. Ah, this film filled me up. Based on the events in the life of Neil Armstrong leading up to the moon landing in 1969, many a viewer came away nonplussed, because they were unprepared for Armstrong to be a stoic, internally drawn lead character. But director Damian Chazelle lets Ryan Gosling play Armstrong as he was in real life, a person of few words, even while recognizing the perils with making this person the lead in his film. There have been plenty of films made about larger than life characters, it is time that we make more about those who are quieter, self-reflecting. I marveled at the impossibly accurate and you-are-there depiction of the NASA efforts to get the first man to the moon. There have been other films made about the moon landing but none that made you experience it like here. 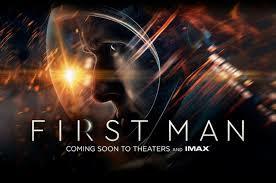 The great wonder of FIRST MAN is how acutely it conveys the sheer odds that were against humans stepping on the moon. Particularly with the computational power available at the time which was less than what most of us have on our smartphones now. And the space shuttle itself being no more sturdy than a tin box. And yet we prevailed.